International travelers are familiar with the vast rules and regulations known as customs, but in the era of international extraterrestrial agreements, even space travelers need their papers. Since the launch of the first component of the International Space Station from Kazakhstan’s Baikonur Cosmodrome in 1998, more than 350 astronauts and private visitors from many countries have traveled to the station. While the idea of declaring something from outer space may be amusing, manned flights to the space station launch from and return to Kazakhstan, and each space traveler must have a passport from his or her home country to enter and leave that country. The space station is operated through an intergovernmental agreement among five space agencies representing 16 countries. In 2009, the five agencies were represented on the International Space Station for the first time. 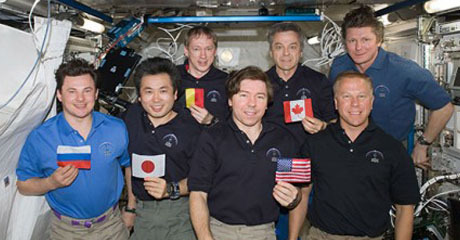 Pictured are (left to right) Russian cosmonaut Roman Romanenko; Japanese astronaut Koichi Wakata; European astronaut Frank De Winne; NASA astronaut Michael Barratt; Canadian astronaut Bob Thirsk; NASA astronaut Tim Kopra; and cosmonaut Gennady Padalka. A visit to outer space may change a traveler’s concept of home. During NASA’s Google Hangout in February 2013, U.S. astronaut Ron Garan recalled his feelings upon landing in Kazakhstan in September 2011. “I remember looking out that window and seeing grass and flowers and thinking, ‘We’re home.’ Even if we’re in Kazakhstan, home is Earth,” he said.